Why do humans need to fly into space? It's a reasonable question, especially considering robots are now capable of performing most of the repairs and experiments previously handled by astronauts. 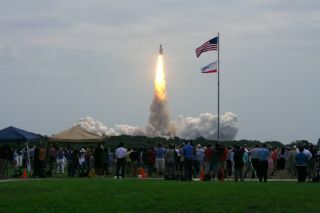 The end of the shuttle program and tightening budgets across the U.S. government has lead many people to ask that question, and answer it in a way that may threaten the future of human spaceflight. Sure, NASA has plans to develop a heavy-lift rocket that could send astronauts to the asteroids or even Mars, and commercial spaceflight companies such as SpaceX have proposed similar rockets. But the reality is that stagnant public funding in the post-shuttle era has already killed one of NASA's plans to return to the moon. Such lack of enthusiasm does not bode well for any hopes of establishing extraterrestrial bases or colonies, let alone reaching for the stars. "To get more money for human spaceflight, there needs to be a compelling reason to do it," said Roger Launius, space history curator at the Smithsonian's National Air and Space Museum in Washington, D.C."Either that reason doesn't exist, or it hasn't been articulated." That has not stopped at least one last-ditch Hail Mary effort for human spaceflight. The Pentagon's Defense Advanced Research Projects Agency (DARPA) is working with NASA to create a privately funded organization which can invest in technologies for launching a starship within 100 years. Toward that end, the Pentagon agency has begun to tackle the existential challenges for human spaceflight head on. The group agreed that the opportunity for discovery and spinoff technologies or innovations could prove especially enticing for early funding sources, as would an emphasis on exploration as a vital part of the human experience. A desire to ensure the survival of the human species might also spur support for deep space colonies or even interstellar voyages, the DARPA group said. That desire could stem from a dangerous asteroid that threatens Earth's cities — or perhaps even all of humanity. Another big motivation may come from the discovery of alien life in the universe, the group agreed. Such a momentous discovery has yet to take place, and could possibly change historical views toward human spaceflight. Any and all incentives seem necessary to spur on a new wave of funding for human spaceflight. That's because history does not offer much encouragement regarding the future of human spaceflight. In an alternate reality, support could have swung in favor of extended human operations on the moon if the Apollo astronauts had found exceedingly precious or rare resources usable on Earth. "It could have been differentif we had found some resource out there, some compound or element which had enormous value to us," Launius told InnovationNewsDaily. China may claim the second place prize for landing humans on the moon if its human spaceflight program keeps up its momentum. Yet the cancellation of NASA's Constellation program intended to return U.S. astronauts to the moon leaves less incentive for a serious lunar race. Perhaps DARPA's plan to drive long-term interest and funding toward an interstellar future may yet prove farsighted. Private sector efforts by SpaceX and other companies may also yield the technologies needed in the short run to explore the inner solar system and perhaps bring down spaceflight costs. Either way, the big thinkers don't mess around when it comes to plotting out the future. The DARPA group proposed an ambitious timeline of proving other Earths exist within five years. Within that time span, it also wanted the 100-Year Starship organization to have a credible plan and high-profile supporters, and to create a blockbuster movie that could spur on public imagination and interest. Goals for the 10-year mark seem even wilder. The group suggested landing humans on Mars, developing faster-than-light communication, creating artificial life from computer code and harnessing the ability to sink carbon on Earth faster than it is being created. Setting ambitious human spaceflight goals can at least benefit humanity by pushing for new technologies that also allow for more sustainable living on Earth, Launius says. "The buzz is a good thing and yields positive results in terms of research we can apply on Earth," Launius said. "But I think the challenge of building such a spaceship means that we're not going to see it anytime soon."